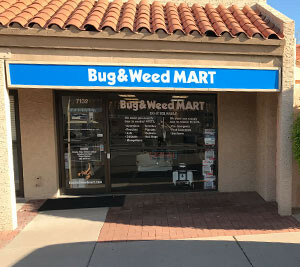 Scottsdale’s Bug & Weed MART is in a new location as of March, 2017: 7132 East Mercer Lane. Many Scottsdale homes have extensive landscaping, so eliminating weeds is a constant battle. At Bug & Weed MART, we not only carry all the products and supplies you need to rid your yard of nutgrass and other weeds, but we also have decades of experience in giving out expert advice on how to address all types of pest and weed issues. If you have citrus trees, you may very well have roof rats. We have traps to capture and remove roof rats, but also carry the supplies you need to stop them from returning. And scorpions like Scottsdale just as much as they like Gilbert and Mesa, too. We sell black lights so you can see where scorpions are hiding on your property, as well as the granules to get rid of them. We will show you how to use all the items we sell so that you achieve the best results possible when ridding your home and yard of all the pests and weeds that are bugging you. If you have a sprayer that isn’t working, bring it in to any of our five Valley locations and one of our store managers – known as Certified Applicators – will do their best to get it working again. Our professional advice has been around for more than 35 years, but it never gets old. Stop in at Bug & Weed MART today to see how we can help you get rid of pesky critters and manage your weed and pest control yourself. Call us if you’re running late. We may be able to stay a bit after hours.